Bailey Gate is a 13th century twin-towered stone gateway, founded by William, earl of Surrey. The north gate with its large vehicular entrance, is the only surviving stone gate of the original ditched earthwork defences. The main road into Castle Acre village still runs between its towers, nearby are Castle Acre Castle and Priory Porch-Tower. 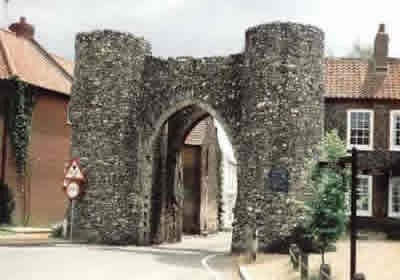 Bailey Gate is located in Castle Acre, off Bailey Street. 16 miles east of King's Lynn, on the A47. The site owned by English Heritage and is freely accessible in daylight hours.